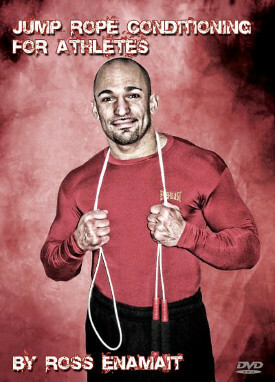 It’s hard to believe that almost fifteen years have passed since I began writing the original Never Gymless book. The years really do fly by. I still remember thinking of the title after finishing a series of hill sprints back in 2005. Plenty has changed since that time, but one thing that hasn’t is the premise of the book. I still run the same hill, and I can always train no matter where I am or what I have. Something else that hasn’t changed is my continued desire to practice what I preach. 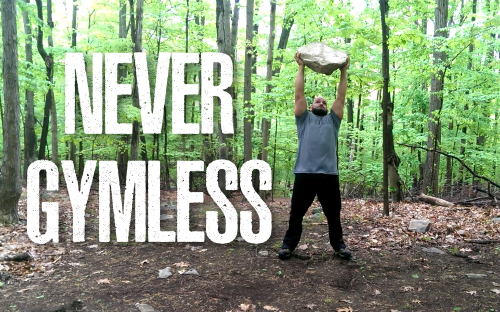 Below is a brief compilation of the Never Gymless concept in action. With a little creativity, you can train almost anywhere with almost anything. Whenever I share outdoor training footage, there’s always someone in the crowd who misinterprets the message. I’m not suggesting that you cancel your gym membership. I honestly don’t care where you train. Just don’t come at me with an excuse that you have nowhere to train. If you want to train, find a way. That’s the message I hope to convey when sharing footage such as that above. In other words, make the most of what you have, rather than worrying about what you’ve been fooled to believe you need. It’s a great feeling to be able to train anywhere with whatever is accessible to you. In addition, regardless of where you typically train, it’s nice to have options. For example, as I’m writing this entry, the snow is falling heavily in my area. The roads are treacherous, so you won’t find many people driving to one of the local gyms. Fortunately, poor road conditions are irrelevant to my training. I can train anywhere. I have nothing against a fully equipped gym, but I sure as hell don’t need one. The Never Gymless mentality is also efficient. Speaking as a boxing coach and business owner, hectic days are a way of life for me. Free time is essentially nonexistent. It’s not unusual for me to work long hours, 6 or 7 days per week. Therefore, if I can achieve a quality workout without driving to a gym, I’ve freed up time that can be applied elsewhere. Increased productivity while avoiding the hassle of being stuck in traffic is what I call a win-win situation. Furthermore, in today’s day and age, people seem to be spending more and more time glued to their electronics. I hardly even see kids playing at the local parks. That’s a damn shame. It’s healthy to get outside and breathe in some fresh air. Our ancestors sure as hell didn’t evolve to be hunched over staring at mobile phones and tablets all day. Put down the electronics and head outside. Whether you are walking, running, riding a bike, or performing a few sets of calisthenics, your body and mind will thank you. In summary, success does not depend on the tools that you own, but rather what you are willing to do with whatever is around you. Thus, stop making excuses about where you are or what you need. It doesn’t matter. You can always do something. There’s almost always someone out there who has done more than you (and me) with less. So, use what you have, be consistent and creative, and good things will happen in time. This is by far my favorite book. Infinate integrity is a distant 2nd. Thanks for rebooting the blog. You the man! This book changed my whole mindset about fitness, helped me stay fit through multiple deployments. Still my most recommended fitness manual to those who ask me. Hope to train with you one day in person Coach! I still own this book and will never let it go.